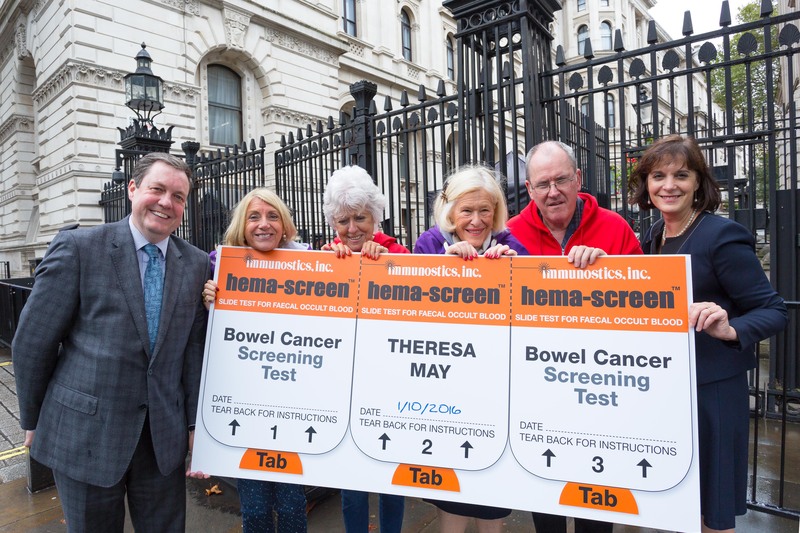 As Prime Minister Theresa May prepares to celebrate her 60th birthday tomorrow (1st October), one thing she probably didn’t expect to receive was a giant reminder to complete her bowel cancer screening test when it arrives in the post. But that’s exactly what bowel cancer survivors and charities delivered to the Prime Minister to mark the fact she is now eligible for the NHS bowel cancer screening programme. The screening test can detect blood in your poo, which can indicate bowel cancer before any symptoms present themselves. This saves lives because although bowel cancer is the UK’s second biggest cancer killer, over 90% of cases can be successfully treated if caught early enough. Charities Beating Bowel Cancer and Bowel Cancer UK delivered a birthday card and a letter to the Prime Minister. In the letter, they appeal to her to help to raise awareness of the importance of screening in order to increase uptake of the test. They were then joined by bowel cancer survivors, some of whom were successfully treated due to early detection through the screening programme, for a photograph with a giant replica of the test. The Bowel Screening Programme involves everyone between the age of 60 and 74 in England, Wales and Northern Ireland (starts from age 50 in Scotland) being sent a bowel cancer screening kit through the post every two years. NHS bowel screening helpline in England: 0800 707 60 60; Scotland: 0800 0121 833; Wales: 0800 294 3370; Northern Ireland: 0800 015 2514. If you’re over the age of screening you can still request a test by calling the helpline. Whatever your age, if you’re experiencing symptoms of bowel cancer for three weeks or more, don’t wait for screening, visit your GP.